Regulars will know one of my major recommendations for anyone visiting Scotland and specifically Edinburgh is to drop by Cadenhead's as it is a fantastic whisky shop. You'll have the choice of a wide range of bottlings from across Scotland that are of good quality and most importantly; not the tourist prices some of the Edinburgh retailers charge. An added attraction are the living shop casks that allow you to bottle your own whisky from a region of Scotland. For travellers these are also available in a variety of sizes and the bottles are almost indestructible! I've reviewed a couple of these over the years as the standard is very good and on occasion something special is put into these casks. For instance a recent Islay cask that was more a young Lagavulin than anything else, or the emergency peated release that was a decently aged Longrow. 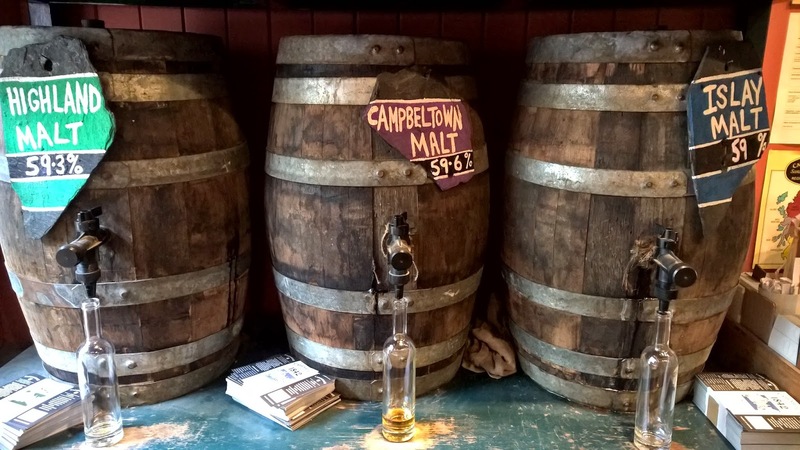 In March during my lastest visit to the shop I was informed about the newest spirit in the Campbeltown cask - you see these casks are always on display in the shop and are filled with whisky when the previous occupant has sold out. This was is Springbank that is well worth checking out. So after a wee nip I purchased the 20cl version (already regretting this!) and the plan was to head back to pick up the 70cl for my own archive, as I do have a couple of full-sized bottles of some of their best cask releases. Nose: malted loaf sitting beside some dying embers, a little Pledge furniture polish and currants. However it does have some unique characteristics with raspberries, mandarins, a little rum and I was picking up roses as well. Taste: now this is where it really delivers as its the texture of this whisky that is memorable; its hugely thick, sticky and chewy like a Highland Toffee bar. These for those unaware were small bars of teeth killing toffee that you can still purchase. Moving on from the texture we have treacle, smoked hickory wood chips, dark chocolate and the sweetness of crunchy almonds. This is a great dram to show off the different textures that whisky can deliver. I just love the presence it delivers on the palate and after a dram you know you've been on a voyage with this one. Update: I did drop by the shop on the 1st May and sampled the cask once again as the strength had reduced slightly. This often happens as its a living cask where more whisky is added as and when. Sadly, most of the distinctive chewy aspect was missing so I've skipped buying a 70cl bottle for now.